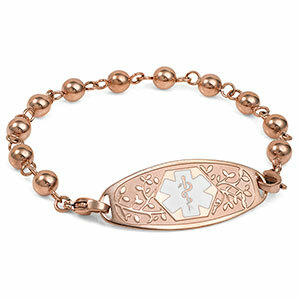 This rose gold classic bead medical alert bracelet is complimented by a beautiful floral pattern tag exclusively designed for Hope Paige! We can engrave the back with your unique medical care instructions. Up to 5 lines of 24 characters each, including spaces!